A trailer is basically a vehicle that is towed by another vehicle. These vehicles are usually used to transports goods and materials. Recreational vehicles, mobile homes, or travel trailers are some of the vehicles that fall into this category. 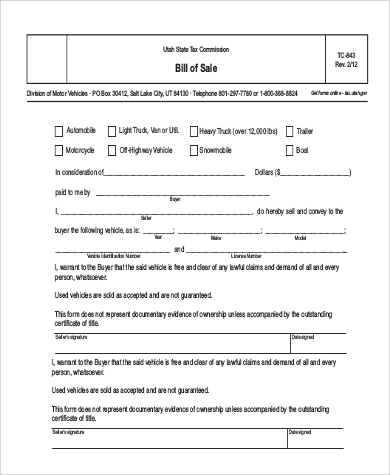 In case you own a vehicle that falls into the trailer category and wants to put it up on sale, a trailer bill of sale can be used. 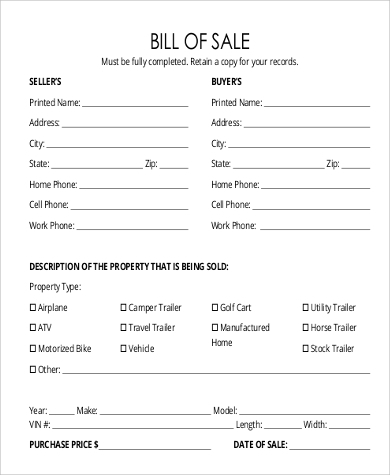 In this article, we present six Bill of Sale Samples you can use in selling your trailer. 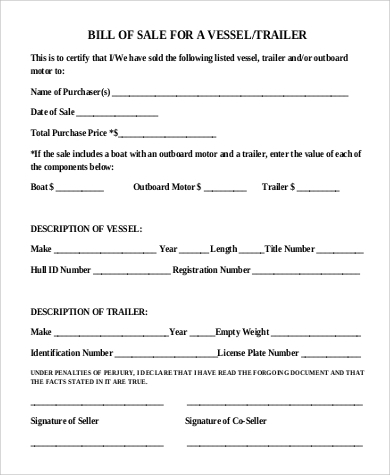 These templates will be your guide when it comes to drafting your own trailer bill of sale. Check out all the samples we have below. 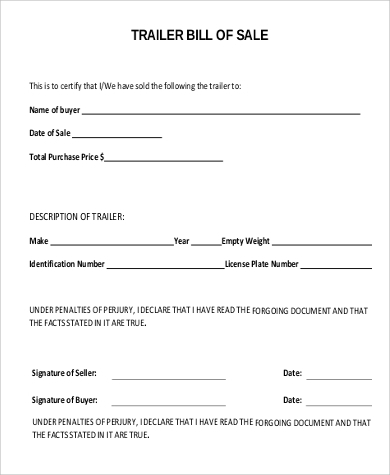 Seller’s Details – This includes the seller’s name, signature, driver’s license ID, and address. Buyer’s Details – This includes the buyer’s name, signature, driver’s license ID, and address. The selling price of the trailer. Trailer details – This includes the make, year, model, warranty (if still applicable), and unique Vehicle Information Number (VIN) of the trailer. The statement that would let anyone who will read the bill of sale understand that the seller is now free and clear of all claims of any kind from the trailer. The statement that mentions that the buyer accepts all the rights and is now responsible for the trailer. The date of purchase or the date when the bill of sale was filed. It documents all the necessary information about the sale including all the details about the trailer. Should there be discrepancies regarding the details mentioned and the actual trailer condition, it will be easy to track down. It is an evidence that can be presented to prove that the sale of said trailer took place. 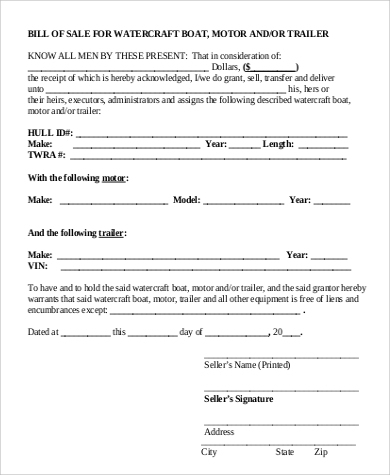 Should the buyer have plans of reselling the trailer, the bill of sale will serve as a supporting document to that sale. There are also other bill of sale samples you can check out at Bill of Sale Examples. 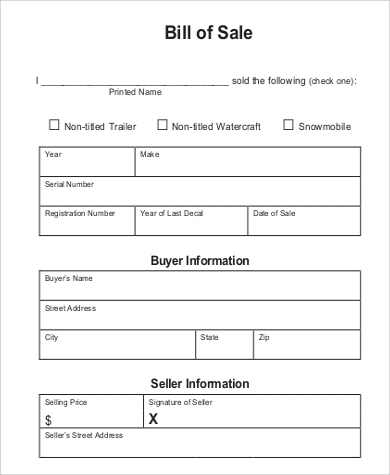 The sample trailer bill of sales featured can be used for various sale transactions involving the sale of various types of trailers. The sample templates can be downloaded at no cost. We promise, no hidden fees and no extra charges! There are six sample templates you can choose from. They all come in different layouts, designs, and purposes. These sample templates come in PDF(.pdf) and Word Document (.docx) files. These are file formats that makes saving in gadgets and storage devices an easy task since these are lightweight in nature. You may simply copy-paste the format and layout of your chosen template. You can alter or replace some of the words to match it with the sale transaction you have experienced. Remember that a bill of sale will always be great to have when it comes to verifying that the sale did occur. It is highly important to have your bill of sale notarized to make the transaction more legal. Refer to more bill of sale templates for other assets at Blank Bill of Sale.